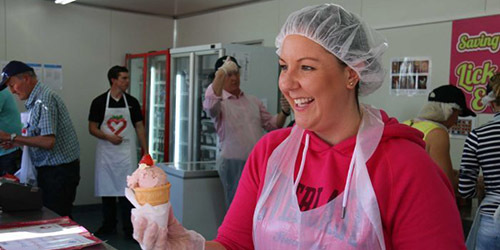 Ekka may be over but the taste of the delicious Ekka Strawberry Sundae won’t be leaving thousands of Queenslanders thoughts for quite a while. This year’s Ekka was bigger and better than ever. Thanks to some fantastic Brisbane “winter” weather the delicious treats went down even easier this year. The sunny weather and consistent attendance meant our team of 2,500 volunteers had a chance to really work their ice cream scooping muscles making over 130,000 ice creams! Thanks to this dedicated group who scooped, chopped and served thousand of ice creams over 10 big days this year’s fundraising is set to be big. With the support of these dedicated volunteers The Prince Charles Hospital Foundation can continue to fund even more life-changing medical discoveries into heart disease, lung disease, dementia and arthritis. Over the past 27 years the Ekka Strawberry Sundaes have helped raise over $2 million for medical research at The Prince Charles Hospital. This amazing volunteer group is proof that when everyday people come together we can create real change to beat some Australia’s biggest health challenges. Check out our Ekka happy snaps here. Guinness World Record attempt set by Queensland students! Get EKKA-cited! One month to go! Just 60 days until the EKKA! 2016 Door Knock - Call for Volunteers! It's back - 2016 Cycle of Giving!